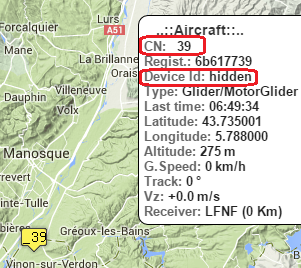 If you want your FLARM to be tracked and identified in OGN you can do it by fully registering your device (Opt-In). Note that you can prevent the OGN network from tracking your FLARM WITHOUT breaking the Anti-Collision functions of FLARM. When you just plugin your device? To become fully visible on the OGN website! You can either use your internal (factory) FLARM ID (which is based on the serial number of your FLARM unit) or your ICAO address (if your aircraft has such assigned). In either case enter the ID you use into the OGN Devices Database. Please also note that once your data is inserted to database it normally takes up to 15 min for the data to become visible in OGN. OGN understands your privacy and if you do not want your device to be tracked, please read below. There is an easy and safe way to prevent tracking. PLEASE do NOT turn off your FLARM because of OGN. With the new FLARM's v.6.x firmware you can set the no-tracking flag on your FLARM device configuration - this tells OGN not to show your position nor track. (To find out how to set this mode in your FLARM please refer to your device's manual). OGN ground receivers fully respect the new FLARM's no-tracking flag and such packets are immidiately rejected by the OGN ground station, as soon as the no-tracking flag is processed. Such data is not relayed the the OGN infrastructure (nor logged anywhere!). Important note: Please remember that if you set the "no-tracking" flag on your device OGN will by no means be able to assist in case of emergency (SAR). Therefore if you do not wish to be "seen" in the OGN display application (live.glidernet.org) we strongly recommend not to use this flag, but to register your device in the OGN Devices Database where you can check the "I do not want to be tracked" option - in such case your position will not be displayed on live.glidernet.org, however it will be logged on the OGN servers and in case of emergency OGN will be able to help! Please note that FLARM informs their customers about possible secondary use cases of Flarms in the corresponding Operating manuals. FLARM radio communications take place in a license-free band in which there is general freedom to transmit and receive. This means that the band is also available to a number of other uncoordinated users. FLARM has no exclusive right to the use of this band and there is no guarantee that FLARM will not be subject to interference by third parties. The transmitter has no effect on what the receiver in the other aircraft does with the data. It is possible that this data may be captured and stored by other aircraft, or by ground stations, or used for other purposes. This opens up a range of possibilities, some of which may be in the pilot's own interest, (e.g. automated generation of an sailplane launch logging system, aircraft tracking, last position recovery), while others may not be (e.g. detecting tailing of other aircraft, airspace infringements, failure to take avoiding action prior to a collision). When FLARM makes a transmission, the signal also bears a unique identification code that can trace to the pilot or aircraft registration. The user can - even though this is not recommended - configure the unit so that identification is generated randomly and alters at one-minute intervals, making a back-trace difficult. Der Sender hat keine Kontrolle darüber, was ein Empfänger mit den empfangenen Daten macht. Es ist grundsätzlich möglich, dass diese Daten gespeichert werden. Damit ist eine Vielzahl von Möglichkeiten gegeben, die teilweise im Interesse des Piloten liegen (z.B. automatische Startlisten, Flugtracking, Last Position Recovery), die aber auch gegen ihn verwendet werden können (z.B. Nachfliegen, Luftraum- und Höhenverletzungen, Verhalten bei Kollisionen). FLARM versendet mit jeder Mitteilung eine Identifikation. Please be aware as well, that OGN receivers form a passive system and do not interfere with FLARM by any means.